My name is Eva Lange M.D. and I have forty years of practice in the medical profession. I also hold a Ph.D. degree in biochemistry (medical science) and have spent over fifteen years in bench research in addition to medical practice. I am an Endocrinologist, trained at the University of Pennsylvania, Philadelphia, where I also worked in Endocrine / bone research field. I have also worked at Temple University and Thomas Jefferson Universities in Philadelphia where I completed my second residency training in Internal Medicine, my first residency originating in Europe. At those two universities I also continued my work in research on a grant rewarded to me by National Institute of Health. Many years of hospital and outpatient clinic experience have taught me the dangers of Endocrine disrupting chemicals so ubiquitous in today’s environment. Our technology driven culture has been introducing more and more chemicals into our lives e.g. oil derived plastics and polycarbonates. They ooze estrogen mimicking substances that disrupt hormonal balance in the bodies of humans and animals bringing host of diseases. Years of work in medical research laboratory with “heavy duty” chemical and radioactive substances caused development of my multiple allergies. I also developed a bone marrow insufficiency, fortunately transient, because I stopped working in the bench research lab. With those experiences came a conviction of using only naturally occurring substances and avoidance of chemicals in my environment. Therefore when I was installing a swim spa for rehab of my broken hip, from a mountain bike accident, I was committed to use NO chemicals. I first tried a commercial UV lamp installed in my pool system and also used a Hydrogen Peroxide drip. H202 does not leave any chemical residue after breaking down to water and free oxygen. However, it was not sufficiently cleaning the pool water. I was lucky to find John Warberg’s Company on the Internet in 2004 and that started the very successful story of my pool’s cleaning as well as the PURE JOY OF ITS USE. I also have a water treatment system for the whole house so the water going to my pool is of drinking quality. Since the use of this enzyme system requires no extensive water testing, I stopped my laborious procedures of testing the pool water. Once in a while I check the pH and invariably see it in the range of 7.45 to 7.6, the same as of my drinking water. Water in my pool is crystal clear, fresh smelling, and with minimal simple salts formation (slick feeling) it is easily taken care of. 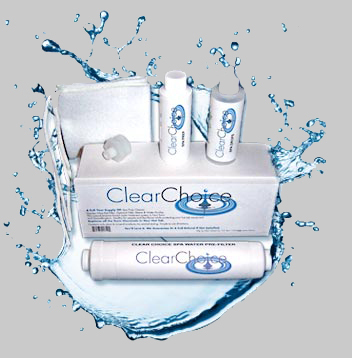 I use about an ounce of Clear Choice’s solution per 3- 4 weeks depending on frequency of swimming and number of persons. I don’t need to use additional cleaning products for the pool’s plumbing system for it’s kept clean at all times. I use NO other chemicals. My indoor swim spa is an Endless Pools brand with 3,000 gallons water volume; dimensions are 7 x 14 feet with two levels of depth at 4 and 5 feet. My pool’s service man at first was reluctant to use the new to him system, He had a pile of chemicals from his store’s shelves and didn’t wish to waste them. I also believe that his consciousness wasn’t ready to accept a system so far away from mainstream pool treatment philosophy. What brought his change of mind were: seeing the effects of my natural healing methods applied to him as well as of the permanently “clear condition” of the pool water. One day he surprised me, bringing over his new customer, a young chiropractor to see my pool. The chiropractor planned to build a rehab pool in his office and wished to use the system I was using. The on-site visit and review of all the conditions of the system I used brought him to the decision of implementing that very system into his rehab pool. In closing remarks I have to state that my level of satisfaction with Clear Choice’s water cleaning system reaches well beyond “the cleaning efficiency” aspect of it. It embraces the consciousness of MOTHER NATURE’S cleaning strategies. This is what is used in all healthy bodies of water. Naturally occurring, life giving, healthy bacteria and their enzymes digest all organic matter residues in the water of lakes, streams, ponds, rivers and oceans to keep them clean. It’s only human’s “wasting behavior’ that pollutes them! PURE JOY OF IT'S USE. I stopped the laborious procedures of all the testing that went along witth traditional chemicals and find the water in my swim spa to be crystal clear, fresh smelling. I have to state that my level of satisfaction with Clear Choice's water system reaches well beyond “the cleaning efficiency”. It embraces the consciousness of Mother Nature's cleaning strategies. We have been using the Clear Choice water purifying system in our hot tub, and we have been very pleased with it. As chemists, we are both well aware of the possible unwanted side effects of treatment with either chlorinating or brominating agents. These strong chemicals do their job, but often at a high cost. They can cause skin irritation for sensitive individuals, and their reaction with nitrogen containing pollutants generates the strongly unpleasant odors of chloramines and bromamines. The natural enzymes in Clear Choice eliminate both of these problems and provide clean, clear water with much less of the fuss and expense of strong oxidizing treatments. Not only is Clear Choice less irritating and less expensive, it is also much simpler to use. We only need to add a few drops each time that we use the tub and clean the filters once a week. We also anticipate that we will not need to drain the tub nearly as often as we did before switching to Clear Choice. We couldn't be happier with the results of using Clear Choice, and we urge others to let Nature take over the maintenance of your hot tub. I can explain some things in more detail if necessary, but I have usually found that shorter is better. Most people are not aware of the chemistry involved, and they resent being lectured to. Thus I hope that this will suffice. Mike McGrath received his Ph.D. in Organic Chemistry from MIT and taught Chemistry at Holy Cross College for 34 years before retiring. Alice Deckert received her Ph.D. in Physical Chemistry from Stanford and is presently the Chair of the Chemistry Department at Allegheny College. Thanks to Clear Choice I can finally enjoy my hot tub to the fullest! It’s so economical and easy to use – no adding chemicals or testing – just a few drops every time I get in. Best of all, there’s no smell, skin irritation or stains in the tub to deal with either, as with all the other products I’ve tried. Plus the water was crystal clear for six months before it needed changing! I honestly believe anybody who gives this stuff a try will be sold on it! I know I am. We have been using this product for 2 years now and it is wonderful. It keeps the tub clear and clean. I can't use normal chemicals with my skin. Now I can enjoy the tub all the time without worry. I love the fact that is takes such a little bit of time to maintain our tub. Our first tub we had was a nightmare to keep everything in balance. It not only saves time but it is a lot cheaper to use that normal chemicals. You don't have to worry about the chemicals hurting your body. It's a winner. Thank you for supplying such a wonderful product. The reason we started using Clear Choice is because I had an allergic reaction to the bromine that we were previously using causing eczema over my entire torso. I decided rather than giving up the hot tub I would research other “non-chemical” solutions. I found your web site, read the testimonials and decided to try it. That was a year ago. We all love it. It doesn't have the chemical smell, smells more like a fresh river stream! Best of all, no more eczema! Just thought I would drop you a note and tell you how much I enjoy your product. I have owned hot tubs for over 25 years and got tired of fighting the chemicals and smell. I decided to try Clear Choice. What a difference. The water stays crystal clear, doesn't have the telltale odor of the chemicals, and is so easy to use. Most important to me is the fact that your skin doesn't itch when you get out. Great product! I will recommend it to everyone I know. This is the most WONDERFUL thing to happen to my spa. I am very sensitive to chemicals and will not put chlorine in my spa or pool. As I was surfing around the net looking for something better to use than bromine or non-chlorine products, I found Clear Choice... And am I happy about it. I used a non-chlorine product before I found Clear Choice which never gave me the clarity and softness. I still had itch and dry skin. I read and re-read the web site because it sounded too good to be true. I emailed questions and got straight answers to my questions (not a sales talk, as one might expect). Some answers I did not quite understand; therefore, I emailed again (and again) until I felt sure enough to order the product. I received my first order Sept. 2002 and after looking at what I got for the money, I really felt skeptical. It all looked so simple, and I did not have to add a bunch of stuff to the spa. Now how can this be? Well, one of the answers I got in an email was, “If I do not like the product at any time I can get my money back...No questions asked.” How can you go wrong with such a guarantee? Now we are talking simple here folks... The kit is a tiny bottle of preparation with a filter to add water through and another bottle which says to add 5 ml/wk. Can you believe it? I did not as I stood there emptying my spa of it's water. I really cleaned that bugger when it was empty and then began to fill using their filter. Yea, sure that filter is going to add “clear” water (our water has lots of clay particles and is really brown sometimes)... To my amazement, the water going into the spa was clear! YEA... I'm impressed. As the months have gone on... I followed the instructions to the tee. I clean my filter every week. In fact, I have two filters that I rotate, so that the filter goes into the spa one week and rests another ... Don't want it to work too hard :) I am faithful about cleaning the filter. I believe it is very important to have a clean filter. I clean the filter in a very dilute bleach and water solution (Clear Choice directions) while I'm sitting in the spa. I then sit the alternate filter overnight in a diluted solution which takes oils out of the filter (I got this product at the spa store months ago). This is not a recommendation of Clear Choice... This is what I do. I like a clean filter. That filter goes in the following week. The water in my spa is beautiful... It is soooo clear. There is a little musty smell in the water because I still keep my solar blanket under the cover (not recommended by Clear Choice) so that my cover does not get waterlogged. I can live with this because it dissapates as soon as I turn the jets on. Having wonderful clear water and NO itchy or dry skin is the best. In fact my skin feels absolutely soft and wonderful after a spa. I am in the spa everyday, more than once a day. My skin is 61 years old and my students tell me they do not believe I am that OLD! I like that. My friend just bought a spa and has chlorine in it. I put my hand in to feel how hot it was because she said it was 103 degrees which I doubted. Mind you I only put in my hand. As I drove away from her home, I could taste chlorine in my mouth (it lasted for a few hours afterwards). I sent her Clear Choice website as soon as I got home. I care about her health and want her to use this product because she will never regret it. I do not understand why anyone would want to use chemicals in their spa. I want to sell this to everyone; yet was told it's sold only on the web. Yea for them. I like people to be in business and make a go. I will not go into a spa that has any chemicals in it. I will wait until I get to my own spa to enjoy life. You guys better keep making this stuff. Thank you for inventing this wonderful product. I would like to thank you for a great product. When we got our hot tub, it came with a one-month's supply of bromine products, so we continued to use that and kept buying additional products to make the water clear. After a few months, we thought we would not be able to use the spa any longer because of respiratory problems we were experiencing. We thought it was because it is installed indoors. We were so disappointed, so I searched online for a different product and found your website. We haven't had any respiratory problems since we switched. This is my third order. Please notify us in advance if you ever discontinue this product...we will buy a huge supply. We will definitely recommend it to everyone who has a hot tub. I am writing to tell you how much I appreciate the Clear Choice treatment system you developed for hot tubs. I am an engineer, I like to measure stuff, so I have long records of maintaining various hot tubs I have had and used since the early 1970's. This long term usage involves a number of different systems, chlorine, bromine, silver ions, diatomacious earth, etc. If the pH was OK, the Total Dissolved Solids was off. If those were OK the Total Alkalinity was off. If those were OK the water was cloudy, etc, etc. I'm sure you know the drill. What a pain that has been. I installed the Clear Choice system according to instructions provided along with a new filter March 3, 2004, and the results have been somewhat unbelievable to me. I have done nothing but add 3.75 ml of the Water Treatment Material each week, and the water is crystal clear, pH about 7.8 (I may have to add a touch of “Spa Down”), and Total Dissolved Solids is 330 ppm, the same as when I first filed the hot tub almost 2 months ago. .I'm using a “Marin” model hot tub by Sundance, holding 320 gallons with a 125 sq.ft. filter running at 104-5 degrees F with electric heat and an insulated cover. It is located outside (just a windbreak on 2 sides) south of Santa Fe, New Mexico, elevation 6,300 ft. above sea level. I originally installed this hot tub November, 1998, and two of us have used it regularly for 10 to 20 minutes each evening since then. It has never been this clear and this balanced for such a long time period with so little attention. Again, thank you for Clear Choice, I'm looking forward to continuous long time enjoyment of near maintenance-free usage of my hot tub with Clear Choice water treatment. Thank you so much for the clear choice water system. The system has made such a difference in our lives. In 1980 we had severe carbon monoxide poisoning in our home. Though our health has improved we still can not tolerate any heavy chemicals such as the chlorines and bromines that are usually put into spas. I have had three or four car wrecks so I need to get into the spa daily. Getting in was a real ordeal because I had to shower off all of the harsh chemicals and limit my use. Since using your spa treatment with the enzymes, it has been a lot nicer because we have not had touse the harsh chemicals. Our spa has been germ free, and I am able to get in as often as I want to without any chemical consequences. Your products are very cost effective compared to the usual chemical additives recommended by spa stores. I have highly recommended this to many of my patients and those that have used it have reported similar results as mine. They are able to get in as often as they like without the terrible consequences from the chemicals. You and your staff have been most helpful in explaining any questions that we have had in guiding us through the process. I highly recommend this to those that are chemical sensitive. I also recommend it for everyone because the bromines and the chlorines penetrate the skin and are not good for the organs and the body systems to function.